We absorb sound at every moment of the day, and even our own body and the physical forms which surround us are made of vibrating matter. It’s no wonder then that sound vibration has such a profound power to affect us. Whilst today Indian classical music is most commonly heard on the concert stage, its existence and evolution is rooted in the ancient metaphysical system known as nada yoga - the art of connecting with divinity and the entire cosmos through sound. In this context, sound and music are much more than something that gives sensory pleasure, but are a medium by which one can find unity and deep fulfilment on every level. Sound vibrations and resonances are used in a judicious way to heal psychological and spiritual conditions. 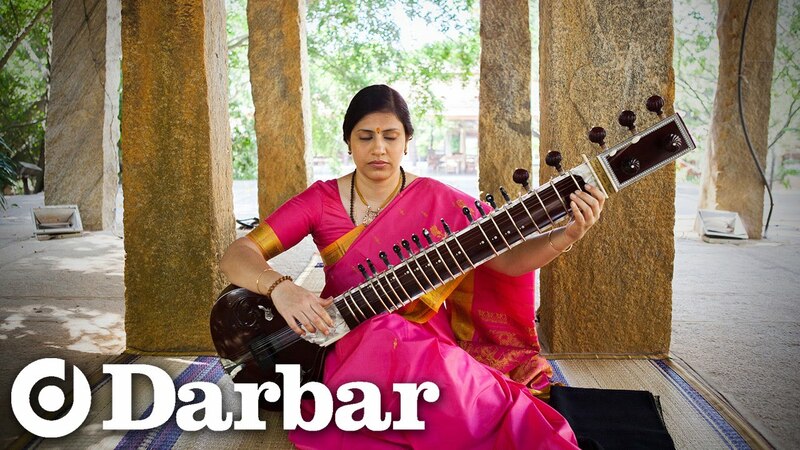 Dedicated practice and exploration of music has long been considered a path to liberation, and many great saints like Thyagaraja, Mirabai, Kabir and Purandaradasa, were simultaneously known for their spiritual depth as well as accomplished musicianship. Their music was a channel through which their passionate desire to reach God flowed, yet the musical compositions are brilliant in their own right and are still sung fervently today, often by die-hard non believers. The Nada yoga system divides sound into two types - anahata, or ‘internal, or unstruck sound’, and ahata, ‘external, or struck sound’. Anahata is sometimes described as ‘the sound of silence’, ‘the sound of the universe’, or in the yoga sutras of Patanjali as the sound syllable, ‘Om’, the sound form of God that is said to pervade all creation. It is believed that this sound is continuously present, and that deep peace and self awakening can be felt by learning to tune into it - sometimes through silent meditation, breathing or singing exercises. Some even feel that the anahata sound can be easily perceived in the silence following the performance of a great musician - the absence of music is not an emptiness, but an energy charged, pulsing fullness. Anahata is also the name for an energy centre in the heart region that acts like a highly sensitive and subtle ear, receiving sound, internally and externally. I, Vinapa, lost my self. Some of the ragas with their associated chakras are listed below. In meditation practise, a person might listen to the raga being played, whilst concentrating on the area of the chakra. Each chakra is also associated with a specific colour, and sometimes they will envision this at the same time. Agnya (third eye) chakra - Bhoop (Mohanam in Carnatic) - helps relieve tensions, anger and mental fatigue and aid forgiveness. Sahasrara (crown) chakra - Darbari (Darbari Kaanada in Carnatic) and Bhairavi (Sindhu Bhairavi in Carnatic) - helpful in prolonging the state of meditation, bringing joy, energy, peace and relief from tension and depression.